On Grinderscape, dicing is a form of gambling. To play, you must be invited to play by a dice host. If the host/player wants to play, he or she will accept the invitation, after which a betting screen will pop up. In this screen the host and player will their bets. The items/cash is usually of the same value. If both are pleased with their opponent's bet, they will both accept, and the host will roll his dice by clicking on his dice bag, which is only available to dice hosts. Both the host and the player can also cancel the bet at any time before the host rolls. If the roll is under 55%, the host wins the game, if the roll is above 55%, the player wins. And if the roll is exactly 55%, the host will reroll the dice. If you win, the bet will automatically be transferred to your inventory, making sure scamming is not possible. Both you and a host bets 50m cash. The dice roll gives the number 78%. 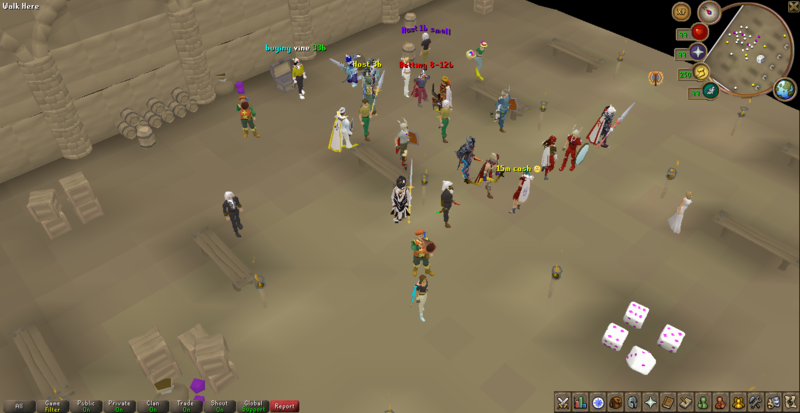 The amount you bet (50m) and the amount the host bet (50m) are transferred to your inventory (100m). If you invite another Dice Host to play you have the option to send a 50/50 bet invitation. This is to make it fair for both Dice Hosts. In this case a roll under 50% means the Host wins, while a dice roll above 50% will go to the betting Host. 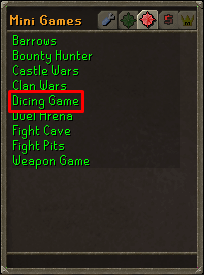 There is currently one location in Grinderscape where you can dice. You can get there by going into your Quest tab, Red circle and clicking on Dicing Game. All Dice Hosts in Grinderscape will have a dice icon next to their name, unless they are also a donator.